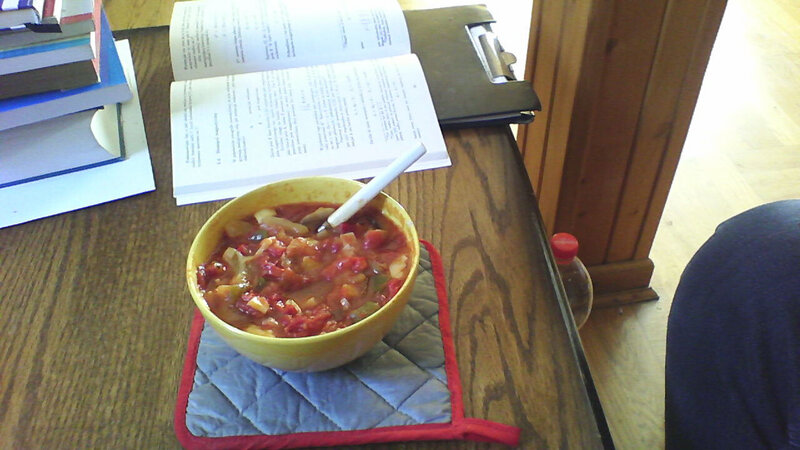 Today I have made a Hungarian dish called Lecsó, which is basically a thick vegetable stew. Aside of being tasty and nutritious, it's among my favourite foods for another reason: being as easy to make as your average Eintopf (best translated as "one pot", as in "you need only one pot to make this"). You basically just need to chop the above ingredients and apply heat, but you should probably start from onions and mushrooms and add zucchini and tomatoes last. 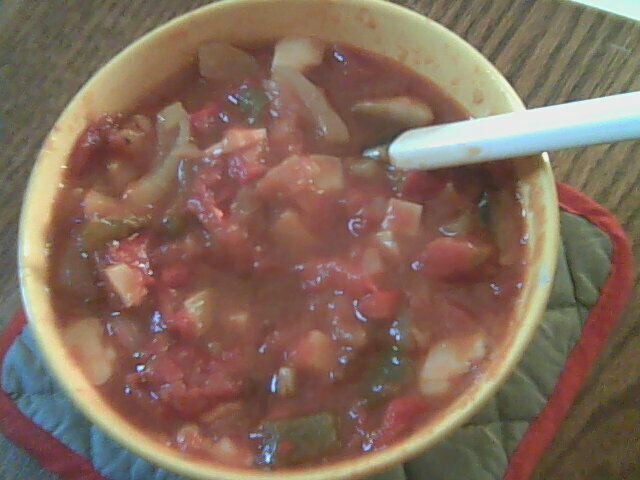 Bullion is optional and best added along with the bell peppers, after the onion will get soft and a bit brown. Garlic can be added along with paprika by each person on an individual basis before eating, since this seems like the only way to make everyone happy. Additional hint would be: don't chop all of it into too small bits or you will end-up with rather repulsive-looking paste (though it tastes the same). Total cooking time on low heat is around 30-40 minutes. If you would like/need more details, don't hesitate to ask :D.
Another fantastic - and incredibly simple - Hungarian food is Uborkasálata, or Cucumber Salad. This recipe is a simple version, but doesn't include the dollop of sour cream on top. However this recipe uses more of the "traditional preparation methods" I am used to seeing... but, it omits the sugar, which is very weird. The freshness of the cucumber, the subtle spice of the paprika, the bitter of the vinegar, the light sweetness of the sugar... this is the best summer salad ever! I went with your recommendation and description and made myself some using this recipe (website in Hungarian, but legible after running it through Google Translate) as it seemed to be closest to the description that you gave. I have to say, the list of ingredients alone made me hesitant at first, as it seemed to result in a rather violently clashing tastes (personally I prefer things to be on the milder side) but I was very pleasantly surprised and didn't even noticed when I had finished eating. Thank you for recommendation, I'm adding uborkasálata to the list of my personal favourites :D.
I was really surprised with how good it was, too. And I realize my cucumbers are just about ripe enough to pick right now.... sooo.... hmmm... I may be having some this week myself! Yum. 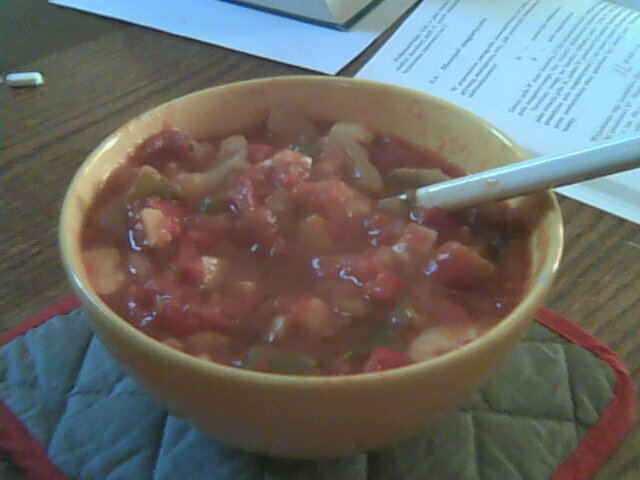 Looks a bit like the minestrone soup I had for dinner last night.